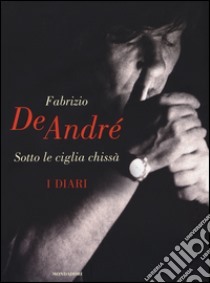 "For years we work on the cards of the archive of Fabrizio De Andr? ?, yet we are constantly surprised by new discoveries and forced to confess every time he" was much more curious "from us. Read his papers scattered sheets, books, exercise books, slide means diaries, envelopes, garbage bags provided by airlines--means browse any piece of paper on which he could sharpen an image at the instant they emerge. A kaleidoscope of seemingly random phrases that however we return the portrait of his secular faith in human decency, the anarchy of who is free from abuse of power and the sarcasm irony typical Ligurian. We smile with his rhymes goliardic or "little thoughts" written purely for the sake of fun. We are forced to stop and think when "thinking and writing become shout, insult or tears of rage." Or, in our opinion, relief. Fabrizio noted instinctively and almost manic impressions, memories, popular sayings learned in alleys of Genoa or learned by the peasants of Gallura, recipes, quotes. In this sea of notes are the ideas that would give life to his songs, transformed then in words that could be placed in "tight spots" left by the music thanks to a meticulous craftsman work and looking for a single term, the better and more agile, able to return all the original idea. Promozione Il libro "Sotto le ciglia chissà. I diari" su Unilibro.it è nell'offerta di libri scontati Scopri tutte le novità appena arrivate #inLibreria!